Accidental entanglement of turtles in abandoned fishing nets has been, and will likely continue to be, a major threat to sea turtles (Wilcox et al., 2015). The impact of abandoned or lost nets, also known as ghost nets, can occur far from their point of origin as nets may drift far distances with ocean currents (Stelfox et al., 2015). Turtles that swim through ghost nets may get their body or flippers snagged in the net, potentially leading to lost circulation and injury to flippers, drowning, or prevention from feeding to the point of starvation (Arthur et al., 2014). Entangled turtles may also end up towing large amounts of fishing gear, resulting in exhaustion and, eventually, death. The animals that escape with severe injuries are highly prone to bacterial infections (NOAA, 2014). Figure 1. Location of the entangled turtle. During a coral reef survey on 9th May 2016, between 11°54´47.35” N and 93°00´58.94” E at Havelock Island, South Andaman (Figure 1), we encountered what appeared to be a discarded net floating in the water, 1 km from the coastline. On approaching it closer, we identified a juvenile olive ridley turtle (~45cm curved carapace length) and a dead snapper (Lutjanus boahr) entangled in the net. Schools of juvenile golden trevally (Gnathanodon speciosus), scissortail sergeant (Abudefduf sexfasciatus), fusiliers (Caesio varilineata) and rudder fish (Kyphosus sp.) were swimming close to the dead snapper, some feeding off it. The turtle was thrashing in the water, struggling to surface. The net was made of nylon fibre and was drifting with the current. We released the turtle from the net by cutting the latter with a knife, and lifted the turtle onto the boat to examine it for injuries. The turtle was observed to be harshly gulping in air but had no obvious external injuries and was released back into the sea within 5 minutes. The olive ridley turtle is an abundant circumglobal species, known to nest sparsely on several beaches on the east coast of the Andaman Islands, and east and west coasts of the Nicobar Islands (Frazier, 1987; Andrews et al., 2006), with an important mass nesting site in Cuthbert Bay Wildlife Sanctuary, Middle Andamans (Namboothri et al., 2015). Information on the natural history of juvenile olive ridley turtles is limited, but the life stage is believed to spend their years drifting with oceanic currents (Shenoy et al., 2011; Stelfox et al., 2015). Our observation of a juvenile olive ridley turtle in the open sea is in concurrence with what is known. The observed incident highlights the threat of ghost nets to sea turtles and other marine wildlife. Awareness programs for local youth, beach clean-up activities, regional workshop for artisanal fishermen on how to ethically dispose of fishing gear, and cooperation between government organization, NGO’s and community members could help in reducing the at-sea disposal of abandoned and discarded fishing gear and thus avoid accidental entanglement of turtles (Stelfox et al., 2014). We would like to thank the Andaman and Nicobar Administration and the Department of Environment and Forests, Port Blair, for granting us permits to conduct coral reef surveys in the area and Department of Science and Technology, Government of India, under the DST- INSPIRE Faculty Programme for funding support. We especially thank the Divisional Forest Officer, Mr Shazi Abraham, and the Range Officer, Mr. A K Singh, for field assistance and Muralidharan M. for comments on the article. Andrews, H.V., S. Krishnan & P. Biswas. 2006. 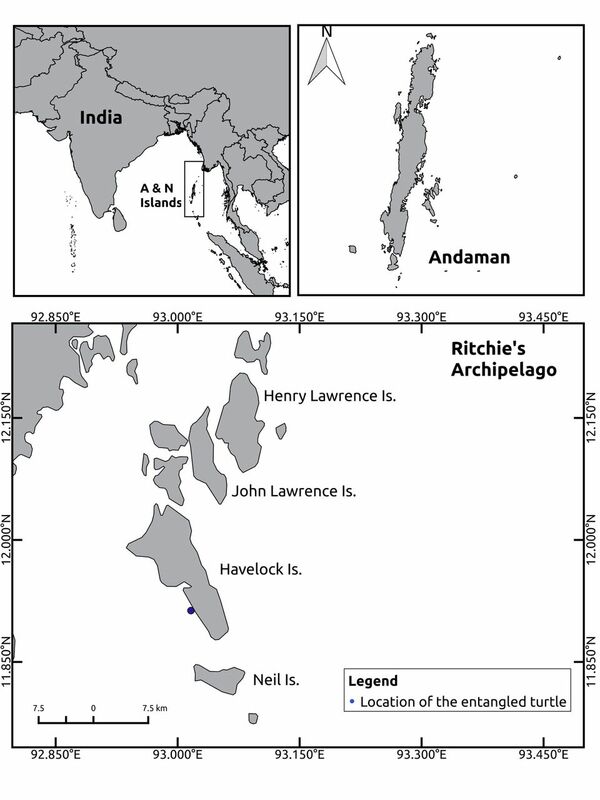 Distribution and status of marine turtles in the Andaman and Nicobar Islands. In: Marine Turtles of the Indian Subcontinent (eds. Shanker, K. & B.C. Choudhury). Pp 33-57. Universities Press, Hyderabad, India. Arthur, C., A.E. Sutton-Grier, P. Murphy, & H. Bamford. 2014. Out of sight but not out of mind: Harmful effects of derelict traps in selected U.S. coastal waters. Marine Pollution Bulletin 86: 19-28. Frazier, J.G. 1987. In search of Kurma. Span 28: 6-10. Kar, C.S. & S. Bhaskar. 1982. The status of sea turtles in the Eastern Indian Ocean. In: Biology and Conservation of Sea Turtles (ed. Bjorndal, K.A.). Pp. 365-372. Smithsonian Institution Press, Washington, D.C., USA. Namboothri, N., A. Swaminathan & K. Shanker. 2015. Olive ridley mass-nesting at Cuthbert Bay wildlife sanctuary, Middle Andaman Island. Indian Ocean Turtle Newsletter 21: 7-9. National Oceanic and Atmospheric Administration Marine Debris Program. 2014. Report on the Entanglement of Marine Species in Marine Debris with an Emphasis on Species in the United States. Silver Spring, MD. 28 pp. Pitman, R.L. 1990. Pelagic distribution and biology of sea turtles in the eastern tropical Pacific. In: Proceedings of the Tenth Annual Workshop on Sea Turtle Biology and Conservation (eds. Richardson, T.H., J.I. Richardson & M. Donnelly). NOAA Technical Memo. NMFS-SEFC-278. 286 pp. Shenoy, S., T. Berlie & K. Shanker K. 2011. Sea turtles of India. A comprehensive field guide to research, monitoring and conservation. Dakshin Foundation, Bangalore and Madras Crocodile Bank Trust, Mamallapuram, India. 14 pp. Stelfox, M.R., J.A. Hudgins, K. Ali, & R.C. Anderson. 2014. High mortality of olive ridley turtles (Lepidochelys olivacea) in ghost nets in the central Indian Ocean. S.I. : Indian Ocean Tuna Commission WPEB10-28. Wilcox, C., G. Heathcote, J. Goldberg, R. Gunn, D. Peel & B.D. Hardesty. 2015. Understanding the sources, drivers and impacts of abandoned, lost and discarded fishing gear in northern Australia. Conservation Biology 29: 198-206.